Most of the post office works of art were funded under the TreasuryDepartment's Section commissions. Those works that were created using TRAPfunds are so indicated. 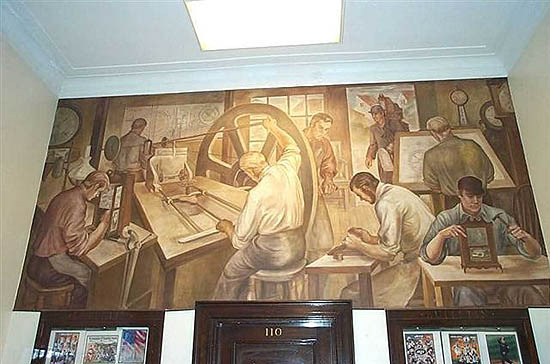 Although the WPA funded the construction of postoffice buildings, the artwork was not WPA but was usually produced underthe Section or TRAP programs. an oil on canvas mural installed in 1939. Photograph taken by JohnFlint. Many thanks to Jimmy Emerson who contributed the photograph.